or the first five years or so of its existence I was blissfully unaware of a certain publication dedicated to Dulwich Hamlet Football Club. It was called Champion Hill Street Blues. When I eventually did come across it I happily bought one or two issues. It contained ramblings about the club I supported. The only other place of which one could regularly read about the Hamlet was in the matchday programme or a few paragraphs in the South London Press twice a week. After reading the December 1993 Number 24 edition of CHSB fanzine, I wrote to the editor, Mishi Morath, shamelessly pointing out the faults of this ramshackle magazine. Perhaps this was very remiss of me. Well out of order to be honest, but I felt at the time I had some valid points to make. Mishi replied to me personally with some valid points of his own, and said that the magazine was governed by its contributors. If I could do any better, then send him some stuff and he would put it in. After all, he had been putting out fanzines since as early as 1984 – the Pink & Blue Bushwacker – when he was just seventeen! And he has never really stopped. Catch the supporters’ coach to an away fixture and read his current offering, the very enjoyable All Aboard The Skylark. My letter appeared in the following edition of CHSB along with several pages of my own contributions that I put in the post to an address on the Aylesbury Estate, just a few hundred metres from my home. Part of my original letter read, “…another 60p worth of countless typing errors, spelling misteaks, mindless obscenities and moronic insults. In its present state your magazine must only appeal to a handful of fans. My opinion of CHSB is not a lone one. Don’t misunderstand me, there is nothing wrong with writing for a small group of friends, but surely it would be better for us all if your readership was enlarged and the bigger section of fans was catered for…. [You also need to] provide the much missed ‘fun’ element that is sadly missing. The cheap laughs that you aim for by prefixing or suffixing that nasty little word “scum” everywhere falls flat on these chucklebuds. …The good points were scattered through Richard Watts’ piece.” Richard’s masterful, insightful match reports are always worth reading. Coming from a graphics background, I felt the standard of artwork alone was atrocious. Looking back now I find it a bit strange to have taken this view. Many years earlier I owned a handful of issues of Sniffin’ Glue, the punk rock fanzine of the 1970s with its DIY poison pen letter type, magic marker headlines and high contrast images. I had since become a bit snobby and thought that CHSB was in dire need of a proper editor. Although I had been aware of Mishi on the terraces of Champion Hill since he was a young teenager, I did not actually introduce myself to him until January 1994. I then realised that nobody else was going to edit this fanzine. And why should they? It was his. He had conceived it, nurtured it and brought it to maturity. The fact that I looked upon the finished product as a spotty juvenile delinquent rather than a fine young handsome man was neither here nor there. Over the next five and a half years I was a regular contributor to the CHSB. My illustrations, obscure jokes, attempted humorous articles, serious historical pieces, spoof love letters from the hapless Member of Parliament for Dulwich to the Dulwich Hamlet chairman, and the odd poem, very rarely, if ever, appeared under my own name. The nom de plumes I chose were borrowed from others. Gravely Roberts for example, is just author Robert Graves back to front and Rufus T Firefly came from a character in a Marx Brothers film. Although CHSB had always occasionally featured pieces on Hamlet history, articles began to appear more regularly on the history of our once famous club. Mishi, myself, Roger Deason and Andy Tucker, to name but a few, took it upon ourselves to do our own research. Others, like Ralph Hopkins, who saw things first hand all those years ago, wrote about their own experiences. It soon became apparent that there was a real interest in things ancient as well as modern. Mishi next decided he was going to produce something called the Hamlet Historian dedicated to the club’s past exploits. A brilliant idea. In 1996, my own book on the Hamlet’s Victory Team of 1920 was published. This was a real confidence boost for me, especially as I was in the middle of a long period of unemployment at the time. It is no fun attending countless job interviews and finding no one wants you. Five hundred copies were sold or given away and a large proportion of the profits went towards the Raise The Roof Fund, a scheme to build a covered stand behind one of the goals at Champion Hill. In the end this never got off the ground and the money, much to my own chagrin, was channeled elsewhere. Soon afterwards, our friendly neighbourhood programme editor, John Lawrence hurriedly brought out the first part of his own ‘The Story of Dulwich Hamlet in 100 weekly parts.’ An unexpected rival we felt were now up against! And then things went decidedly pear shaped. Mishi’s ill conceived comments regarding the Turkish earthquake in the penultimate CHSB Editorial didn’t go down too well in some quarters. It was blatantly obvious that some people had a right to be upset. 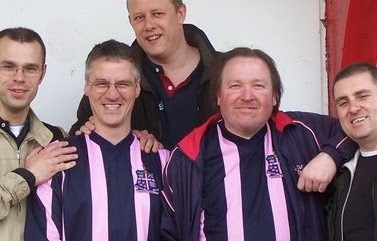 Especially any Turks associated with Dulwich Hamlet Football Club. Following that notorious issue of CHSB, I was approached by a group of fans who decided that this was the last straw. They were reluctant to write for that fanzine anymore. Would I like to join them in creating a new less shoddy magazine? I accepted the offer but pointed out, however, that I would not want to do anything behind Mishi’s back. Until he was told that a rival to CHSB was hitting the stands (and the terraces) I would continue with him. I seem to remember being assured that he would be spoken to very shortly. Whether he was or not, I don’t know. I very rarely frequented the bar or engaged in terrace talk, so most of the time I didn’t know what was going on. No change there then. With hindsight I feel I may have been slightly misled. I certainly don’t recall doing anything dishonest or underhand. My memory is that Mishi wasn’t happy about the exodus of his ‘staff writers’ all jumping ship at the same time. But I was under the impression that Richard would take over the new editorial role while Mishi would become a contributor to the new magazine. His main concern could then be the Hamlet Historian, something perhaps more suitable and certainly closer to his heart. I committed myself to provide four pages per issue to a new magazine, Thinkin’ Pink n’ Talkin’ Blues. It was my usual fayre, the same old ‘same old’ that went into Champion Hill Street Blues. The final CHSB was produced, and was quickly followed by the first appearance of Thinkin’ Pink n’ Talkin’ Blues in October 1999. By then the country was in the middle of the internet revolution and some wondered if this would spell the end of the printed fanzine. It didn’t – fanzines just went online instead, with everything else. Adam Shahin’s Dulwich Hamlet Online site www.dhfc.net (which had already been in existence some time) meant that topics could be raised and discussed instantly, instead of weeks after the event, as in the case of a printed fanzine. And without a paste-up line in sight. Mishi Morath, king of the paste-up line, may have been down but he was not out, and was set to make a comeback. Pink & Booze – the two loves of his life – was the title of his new offering. He was going to show them, the insurrection, that he could go it alone. He did have one or two faithful men who provided him with a few odds and ends – most notably Paul Griffin. But even Griff, it became clear, was saving his own sterling efforts for his excellent hyperbolic Southwark News match reports. Reports and news items, which in turn, were repeated on what was quickly becoming a more and more slick website. But now there were two Dulwich fanzines to collect and read – your poor man’s Snooze and SLoP I suppose. Like the Beatles and the Stones alternating their singles and LPs in the sixties, Richard and Mishi came to a gentlemen’s agreement that they would not publish in the same week. And they never did. The first four issues of TP&TB had a mighty 40 pages each. A tall order, I think, to keep up. The fifth and final issue (dated October 2000) was 12 pages short of the mark, but there was plenty there. 28 pages is ample for a fanzine. In that issue Richard stated that he needed more input from others, else the venture would fold. P&B on the other hand soon became little more than a ‘Do they mean us?’ fest. Thankfully Mishi eventually saw his alcohol addiction for what it was and managed to quit drink altogether. For over a decade now the club’s most renowned supporter has been ‘dry’. Long may it continue. He remained editor of the Hamlet Historian until he handed me the reins in 2003. His regular offerings and encouragement helped me take on the new role with a fresh zeal. Collecting first hand accounts from old players and supporters, and digging up buried treasures from a glorious past has, we trust, brought the Hamlet’s history alive to our own generation. I have a lot to thank Mishi for. Had he not asked me to send some articles in to CHSB I would never have gone on to churn out countless send up pieces that people seemed to enjoy reading, or go on to do so much research. That in turn led to writing a small book about the club. And then going to great lengths to ensure Edgar Kail received a Southwark People’s blue plaque, as well as commissioning a fitting bronze monument to Pa Wilson the father of Dulwich Hamlet. So I have him to thank for that. But this is beginning to sound more and more like an obituary to Mishi D. Morath. And that’s the last thing he’d want. Slightly adapted from a previously unpublished piece written in 2001.